As we ramp up posts about New York Comic Con over the next few days, prepare for a barrage of posts from your favourite artists, Designer Toy store and companies. 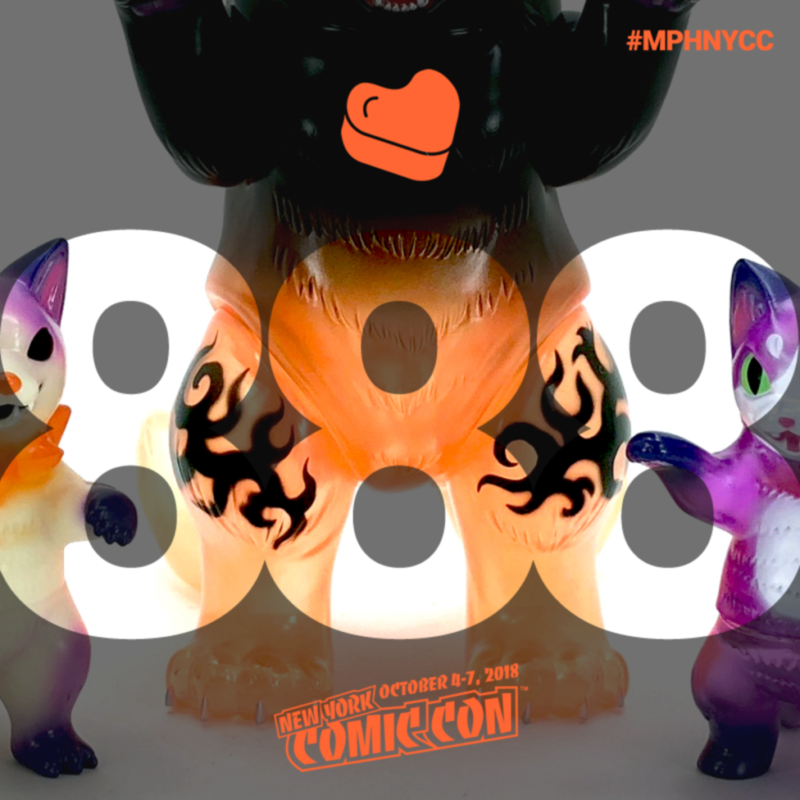 Heads up, this is a long post on the exclusives & releases that our friends at myplasticheart will have on their booth #888 over the course of NYCC weekender (4-7th October). Featuring Glow-In-The-Dark vinyl with orange and purple spray it will go perfectly with your Halloween display and completes the Konatsu Halloween set! Halloween Shibara is $38 each. Negora in a spooky clear purple vinyl with orange and green accents… and don’t forget the odd eyes !! Halloween Negora is $38 each. Trick or Treat? Just in time for the festivities… Halloween Daioh Negora is $85 each. In collaboration with Toy Pizza we will release the Knights of the Slice Skattum Slime Knight Edition by Draculazer. Attn New Yorkers! Uamou has prepared a fresh batch of Statue of Liberty Fortune UAMOU in a new colorway! Version 2 features a sparkly pearlescent green and sports the gold crown and torch. This is a special early limited release of Jim McKenzie’s newest figure, the Baby Scarecrow. Baby Scarecrow will be priced at $85. “Skinned” edition of Tarbus the Tardigrade by DoomCo will be slithering its way to NYCC. This Tarbus features a clear pink and blue marble and glows electric blue. Priced each at $20. A special release of Algonac the snapping turtle by Chris Ryniak will make its way to NYCC! This version is transparent pink but glows bright blue in the dark. It’s magic! Priced at $20 each. Brent Nolasco has created a super limited run of his Arc of Time resin sculpture in a new colourway specially for NYCC! Each are priced at $200. Shades of Grey Camocats are hybrid hand felted / resin casted creatures by PlushPLAY. They will be available at myplasticheart booth #888 during New York Comic Con. $65 each. Foo Pup is back and in a blazing new color! Designed and handmade by Reactor88. Foo Pup is $40 each. A selection of delectable Breadcats by Rato Kim will be available at myplasticheart booth #888 during New York Comic Con. We’ll have Melon, Cow and Sky flavors ⛅️. Priced at $38 each. MITT IS VENOMM!!! Your favorite French bulldog MITT is all dressed up as his favorite super villain! $65 each. Seulgie is helping us celebrate Halloween with a witchy version of her Pooltime Kitty! Each figure is handmade and comes with a witch’s hat and cauldron. $100 each. Three versions of her beautiful Inu-Harigon character (Otsukimi, Chinese Spring Festival and Muscat) will be available at myplasticheart booth #888 during NYCC!